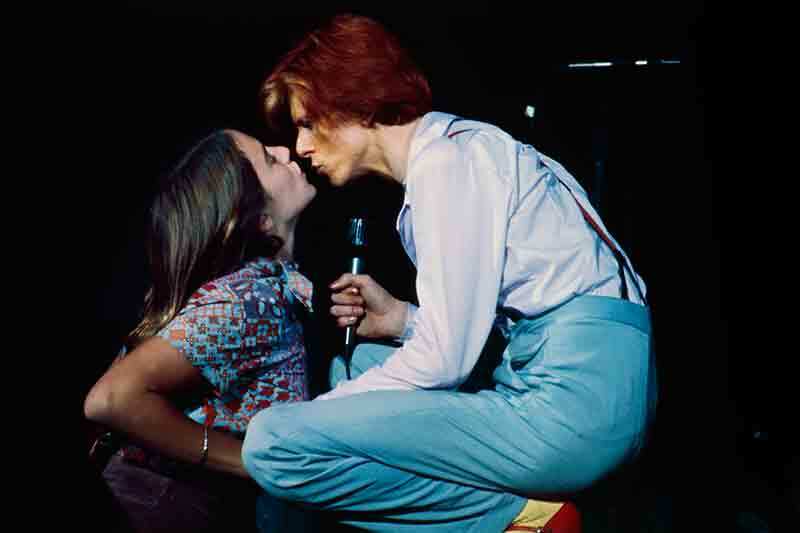 Who’s that girl in Terry O’Neill’s Photograph of David Bowie? ‘The first show I’d shot of David was at a very small club in London, so I thought I knew what I was getting myself into. But I was absolutely astonished at watching him perform in front of such large audiences in the US,’ O’Neill says. ‘There wasn’t that divide you have now between audience and performer. ‘As he bent down, I could see what was about to happen, so I readied my camera. I was able to capture that one singular moment.’ But the question remains – who is she? If you know, get in touch. Bowie By O’Neill exhibits in Beverly Hills, LA – The exhibition ran from October 29 through to November 9 at the Mouche Gallery in LA, celebrating the launch of Terry O’Neill’s new publication ‘Bowie By O’Neill’.